I'm Unschooled. Yes, I Can Write. : Why Can't You Just Unschool Part Time? 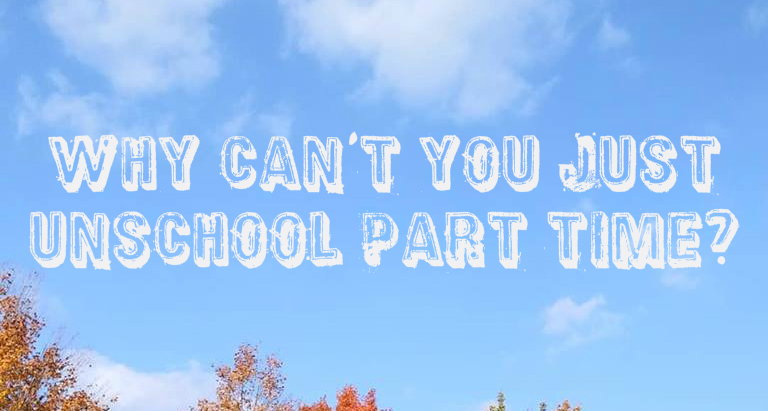 Why Can't You Just Unschool Part Time? In every collection of unschooling skeptics I’ve come across--such as that found in the comments section any time unschooling is covered in a major outlet--you’ll always find the question of why people can’t just unschool part time. Why does it have to be a full-time gig? Can’t children just go to REAL school to get a REAL education and do that self-directed nonsense in their downtime? Between school, and homework, and extracurricular activities, and things like sleeping and eating, your average child has very little actual free time. And in what little free time they have? They’re tired. They need to relax, to unwind, to veg out. That time can certainly be an important part of learning, as I’ve discussed before. But to suggest that all the richness of a self-directed education can be squeezed into what little free time a child has leftover is completely absurd. The way education is approached in school, the fundamental ideas underpinning it, are antithetical to unschooling. Children in school are being taught that learning is something done to them; that learning can only be imparted by experts; that other people know what’s best for them and hey get no say in how their education unfolds; that children are not capable of making any decisions about their learning; that learning is always difficult and complicated. Unschoolers, on the other hand, know--and live the knowledge--that learning is ever-present, and happens with all different people in all different places; that play should form the basis of childhood (and of learning! ); and that children are perfectly capable of directing their own education. Ideas about what education is and how people are educated differs dramatically between conventional schooling and unschooling, and without making a conscious effort to reject strict school-based ideas of how education works, you can’t really unschool. 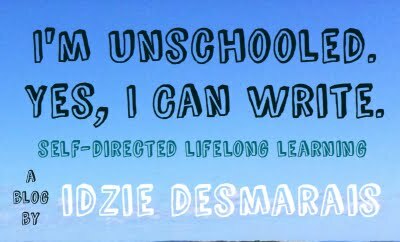 Unschooling is a way of life. It’s a full-time commitment to living a rich life with children, providing a safe and resource-filled environment, building respectful relationships, seeking out opportunities in the community, and trusting that children are incredibly capable learners. Unschooling is a philosophy that trickles into every aspect of your life, colouring all your relationships with a greater understanding of everyday consent and principles of non-hierarchical living. While families unable to unschool can certainly take inspiration from unschooling in the ways they parent, talk about learning, live together as a family, or treat the children in their communities, that alone is not unschooling. There is no way to simply squeeze unschooling into the bits of life left over after school and on weekends. It’s too big to just fit into six weeks of summer vacation. You can’t unschool part time, and those who ask why this self-directed learning thing can’t just be supplemental are showing a profound ignorance of what unschoolers are attempting to do. *A note that sometimes unschooled kids/teens go to school by choice, and that is most definitely practicing self-directed learning. I think the most important part about unschooling is the bit about respecting children’s rights to make their own decisions as much as possible, which means fully supporting them if they decide they want to go to school. I hope it’s clear that what I’m talking about in this post is not that, but rather the skeptics who don’t believe in young people’s right to truly direct their own learning. I've added your blog to my list of links on my webpage. I hope to be a regular visitor, here. What do you think about kids in marginalized communities? Many of these kids aren't surrounded by literacy in the same way that "middle-class" kids are, many of these kids have drug dealers on the street corners living near them. So, if these kids unschool and learn the "basics" needed for their survival and to thrive.... it might lead them on a whole 'nother path. However, at the same time, school are the MOST oppressive for these kids. What are your thoughts?